The 6th Annual Carolina Fall Nationals unfolds this week at the North Carolina Quarter Midget Association’s home track in Salisbury, N.C. featuring four days of activity, culminating with A Mains on Saturday. The track opens for controlled practice, safety inspections and sign-ins and registration on Wednesday. Thursday’s Thanksgiving agenda is limited to Safety Inspections and sign-in and registration. A drivers and handlers meeting is slated Friday at 8:15 am, followed by qualifying at 8:30, with racing to follow, with racing continuing until 11 p.m. A final drivers and handlers meeting is again scheduled Saturday at 8:15 am, with racing commencing at 9. Trophy presentations will follow the racing program. Sunday has been reserved as an alternate for completion of the program if necessary. 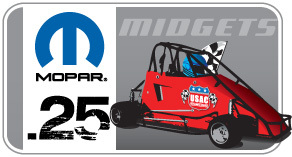 Three North Carolina drivers earned 2010 USAC “Generation Next” championships and are slated to be honored at USAC’s “Night of Champions” Awards Banquet December 3 in downtown Indianapolis, Ind. They are Neal Allison of Greensboro (Junior Rookie), Mark Miller of Mooresville (Senior Honda) and Tyler Shullick of Concord (Light World Formula and Light AA).